Global Imbalances, Financial Crises, and Central Bank Policies assesses the relationships between global imbalances, financial crises, and central bank policies, with a specific focus on their reserves. 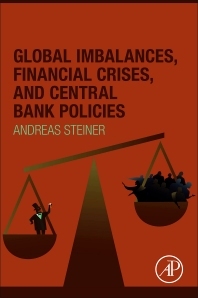 The book contains a strictly international perspective with an analysis based on empirical research that enables the reader to develop an analytical model that emphasizes interactions among individual central banks. With this innovative approach, the book develops a new method for defining an optimal demand for reserves. In addition, the book describes implications for financial reforms that might ultimately be more important than its empirical findings. Andreas Steiner is an economist at the ifo Center for Business Cycle Analysis and Surveys. His papers have been published in the European Economic Review, the Review of International Economics, and the Journal of International Money and Finance, among other titles. He has lectured on International Trade Policy, European Economic Policy, and Economic Policy and Public Finance.